Toyota acknowledges a problem for some of its vehicles which has never been subject to recall. Drivers of the Matrix, some Corollas and first-generation Prius' are finding that their odometers stop at 299,999 miles. For Toyota, it's a good problem. The company is making some reliable, durable cars. But for some consumers, it's costly. Paying for the fix is still left to the car owners. Ernie Scott has been driving his 2005 Matrix 100 miles a day, five days a week since he bought it new. His current mileage -- about 304,000 miles. The key word is "about." Scott is estimating his mileage. Scott took his car to John Elway Toyota to get it fixed. The dealership referred NBC4 to the manufacturer. 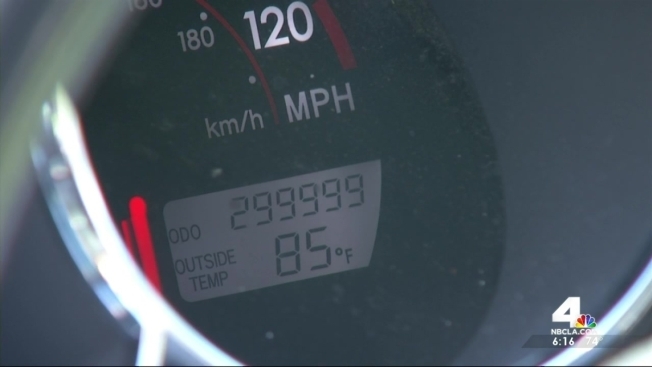 A Toyota spokesperson acknowledges the odometers don't record mileage beyond 299,999 miles. The cost of replacing the odometer is $580. Only a certified dealership can replace the part and is required to report the change to the DMV. "The rule is that we just put down what we see and that's it," said Oren Hizkiya, who does smog checks at 15 Minute Smog. "It's not our responsibility to verify odometers." You can still pass the tests that allow you to register your vehicle legally with the state with an odometer that has reached its mechanical limit. The state just requires full disclosure. "Obviously, I've maintained it because it's lasted so long," he said. Scott says he bases his car maintenance on his mileage, and feels the odometer should be replaced for free since Toyota is aware of the issue. They said they'd pay for half of it. That's still about $270 out of pocket for Scott. Toyota calls it a good-will offer. Scott says Toyota is missing a chance to turn a problem into profit, and put more people behind the wheel of their cars. "I think they would be happy to say, 'Yeah, look at all the cars we have that the odometer stopped at 300,000 miles,'" he said. "That would be a selling point, I would think." The Toyota models affected by the odometer issue are the Matrix, Corolla and the first-generation Prius. Toyota recommends contacting the manufacturer directly, as opposed to a dealership. It's the manufacturer that can extend a good will offer to pay for half the replacement costs, which the company says is fair. They consider it a maintenance issue.